If you are a Stars Wars fan, you live for the next movie. If you love watching Test cricket, you hang out for the first match in Australia. And if, like me, one of your favourite authors is Rebecca Stead, you buy her latest book as soon as it’s published and read it cover to cover in a day! Rebecca Stead is the author of award-winning books like When you reach me, Goodnight stranger, Liar and spy and First light. I have reviewed her books here. She has co-written a book with Wendy Mass called Bob, with gorgeous illustrations scattered through the chapters by Nicholas Gannon. (I’m looking forward to reading Mass’s many, many books now!) It sits at the lower end of middle-grade fiction – I know both Miss 11 and Mr 8 will read it once I pass it on. Livy (ten and a half) has come back with her mother and baby sister from Massachusetts to visit Gran in Australia. Livy knows she’s forgotten things since her last visit five years ago. She can’t remember her old elephant toy Rufus or why she loved holding on to the black pawn piece from the chess set. And she certainly can’t remember the name of the green zombie (who’s not really a zombie) who’s wearing a chicken suit, lives in a closet and has been waiting for her to come back for the last five years. Bob reminds Livy of the best parts of her ‘old’ self, is excellent at reading her face and is pretty much invisible to adults in his homemade chicken suit. 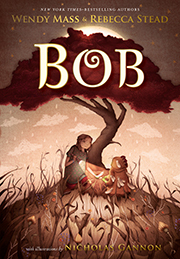 Livy tries to help Bob find a way back home by remembering how he saved her, and then how she saved him. The story is fresh and original – it is a quest book and there is magic but there’s nothing predictable about it. There are themes of friendship and memory, and a small thread of rain and droughts. Stead writes the chapters from Livy’s point of view and Mass writes the ones from Bob’s perspective. It has been a labour of love for both of them for about seven years, sending the chapters back and forth, responding to each other’s work. Teachers can find notes and classroom activities here. Please buy this beautiful, beautiful book for your kids, your grandkids or your library. Be warned – if you are one of my lovely nieces or nephews or if you invite Mr 8 or Miss 11 to a party, you may well receive this book during the next few months! Everyone needs a Bob! Glowing review, Karen. I will check it out soon. Your enthusiasm has me sold, Karen! I hope your girls enjoy it, Felicity!